Glacier Bay Nolita 3-Piece Bath Accessory Kit in Chrome includes a 18 inch. single towel bar, a C shape towel ring and a single post toilet paper holder. The contemporary design compliments any bathroom decor. This set compliments the Nolita 1 handle single hole bath faucet. Limited Lifetime Warranty. Matte black is gaining popularity because it brings out the tones of natural stone and adds a focal point to your bathroom. Choose our sleek and easy-to-manage faucet. A modern look with a single lever handle. Faucet is constructed of a solid brass body for enhanced finish and performance. Offering sleek, sophisticated styling, the Torrance collection from MOEN is available in a variety of designs and finishes that blend seamlessly with any home decor. Designed for simple operation with a one-handed lever, the Torrance Single-Handle Standard Kitchen Faucet comes complete with a coordinating side sprayer for flexible cleaning. 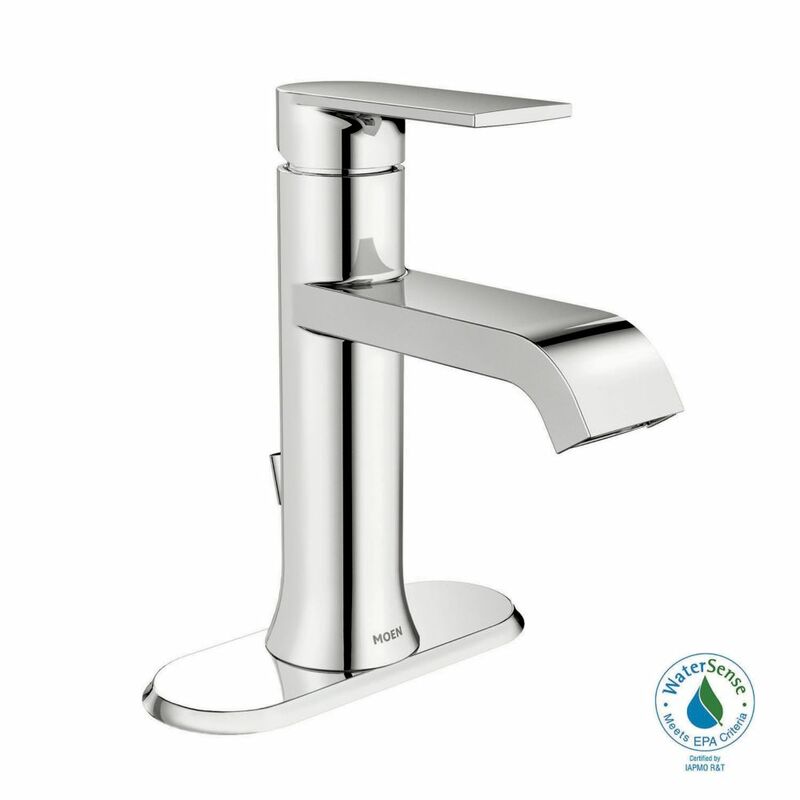 This model also features MOEN's exclusive Spot Resist finish that resists fingerprints and water spots to maintain its original brilliance and easily wipes clean, ensuring the beautiful stainless appearance will continue to shine over time. Elegant, traditional design details and distinctive finishing touches present a sense of uncommon luxury in the Weymouth collection. Distinctive accents include porcelain inlays that feature Euro-influenced decorative script and signature styling elements. A matching line of bath accessories is available to complete the look of your bath. This trim kit requires MOEN valve 9000 to complete installation. Genta Single Hole Single-Handle Low Arc Bathroom Faucet with Lever Handle in Chrome is rated 4.5 out of 5 by 214. Rated 5 out of 5 by HomeDepotCustomer from Had a plumber install the faucet it looks beautiful.... Had a plumber install the faucet it looks beautiful. Rated 5 out of 5 by Kelly from Easy to install. Great to use. Long neck makes it... Easy to install. Great to use. Long neck makes it easy to fill dogs water bowl, wash my face, and especially for cleaning. Rated 5 out of 5 by Handydandy from I love this faucet. It is beautiful and was very... I love this faucet. It is beautiful and was very easy to install. It came with everything you need to install it with minus plumbers putty for the drain spout. I highly recommend. Can you please confirm assembled measurements? Height only 3 inches?? Assembled Depth (in inches) 20.75 ? Assembled Width (in inches) 9.44? Thank you so much for your interest in Moen products. Please see link to review product specs http://www.moen.com/shared/docs/product-specifications/ws84760sp.pdf. If you have additional questions, please complete the form at http://www.moen.ca/consumer-support/contact-us or call Moen at 1-800-465-6130. Our business hours are 7:30 a.m. - 7:00 p.m. Monday through Friday EST. Hello.&nbsp; Do this faucet come with the drain assembly? Looks like a beautiful faucet. Can it be installed on a pedestal sink? Does it come with a drain? Thank you so much for your interest in Moen products. The ISO faucet comes complete with a Non-Metallic waste assembly. If you have additional questions, please complete the form at http://www.moen.ca/consumer-support/contact-us or call Moen at 1-800-465-6130. Our business hours are 7:30 a.m. - 7:00 p.m. Monday through Friday EST.